Figged out yet? I’m not. Still love painting them but boy, do I have a lot of them to fashion into a delicious meal for one this weekend. Any ideas?? Have a great weekend. On my shopping trip, I found this lovely stone planter which I thought would be a great challenge to paint. Still had the figs though……….hate waste! 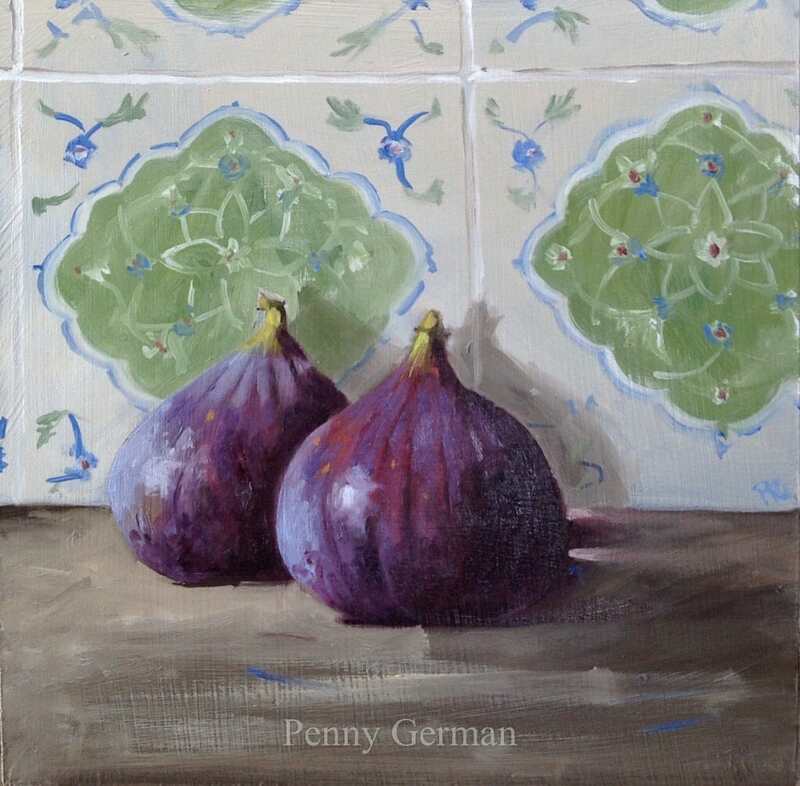 Continuing on the figs and tiles theme………………. here’s another. I’m really enjoying painting these plus I get to use my gorgeous Michael Harding King’s Blue….mmm. It’s harrowing reading, I must warn you. I’ll remind you about it and give you the link on November 1st when it goes live. Excuse my absence last week but family matters are keeping me out of the studio lately. 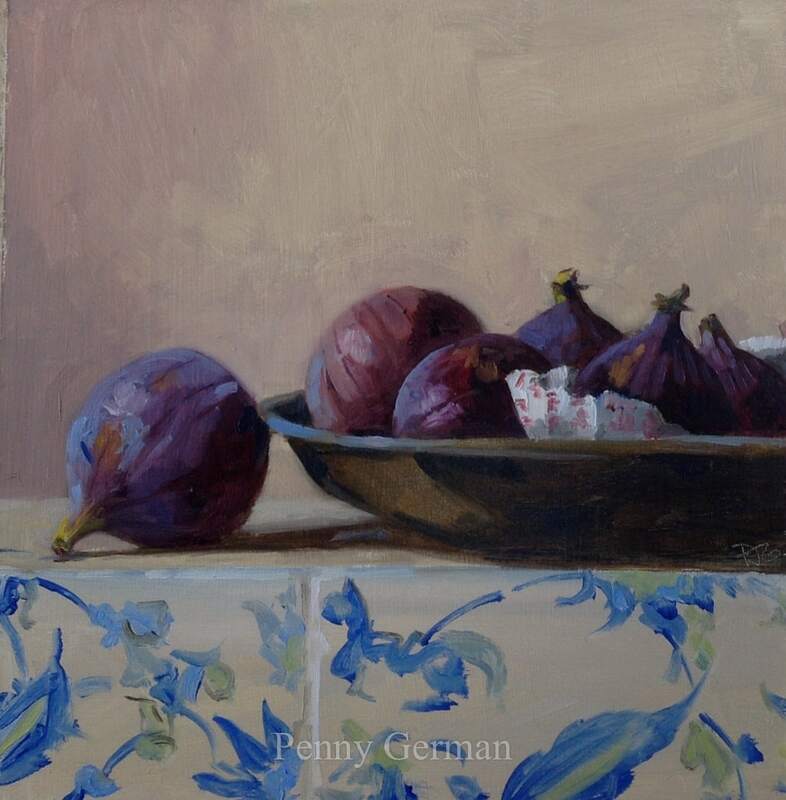 Anyway, prepare for a fig fest as my favourite fruit are plentiful and I’ve been coupling them with Iznik tiles. Off back to Cumbria where events may mean I need to go off piste for a while so forgive my absence if I do. Here’s the last hydrangea painting for now. Delighted to say that I’ve been delivering some larger paintings today to the Russell Gallery, Putney for their Christmas Exhibition starting 27th November. Lovely gallery and today the walls were adorned with some rather wonderful Ken Howard, Peter Brown, Richard Pikesley and Jane Corsellis works to name but a few. What a feast for the eyes! So anyway, all that jollity meant no studio time today so here’s one that was slipped into a handbag at my open studio on Sunday. Paid for of course! 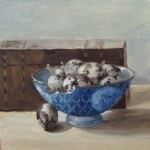 Last of the quail eggs although I’m looking forward to doing some more. This box has been on our mantelpiece for years. Funny what you can find to paint. Well my open studio day was lovely but I don’t think I’ve ever drunk so much tea and coffee in one day! The sun shone and it was lovely to see new and familiar faces. Here’s one that didn’t make it into a bag! I can’t ever resist these little beauties but never quite sure how to use them up nice I’ve painted them. I suppose Jobbers and I could dress up in our finery and have them with champers for supper from a silver platter? Maybe not. Any ideas?